An engaging and amusing foray into big-time adventure, Journey to the Center of the Earth is one of those happy accidents where a major studio created great entertainment with a story that begged to be cheapened or ruined. For that we can thank Walt Disney for his uncompromised version of 20,000 Leagues Under the Sea -- its high standard obviously had an effect on this lavishly mounted epic. Running to pattern, the Fox producers of Earth signed up James Mason and surrounded him with a capable cast that included teen crooner Pat Boone, who is not at all bad. Best of all, the show's script has an adroit sense of humor that lets the journey be serious while maintaining a borderline tongue-in-cheek tone. The result is a fantastic adventure with something for everyone. A volcanic rock leads freshly knighted professor Oliver Lindenbrook (James Mason) to Iceland to seek Arne Saknussem's secret trail to the center of the Earth. Braving a rival who tries to steal his expedition and a haughty Saknussem heir (Thayer David), Lindenbrook goes bravely forward into the unknown, accompanied by his protégée Alec McEwen (Pat Boone), guide Hans Belker (Peter Ronson) and the widow of his rival, the redheaded, single-minded Mrs. Carla Goeteborg (Arlene Dahl). Jules Verne's fanciful tale of spelunkers who find a prehistoric world still thriving at the core of our planet doesn't mesh well with 20th-Century technology, and the best decision by producer Charles Brackett (Billy Wilder's ex-partner) was to retain the original's 19th-Century period trappings. George Pal had updated H.G. Wells' War of the Worlds to great acclaim, but Verne's antique tales are rooted in 19th century whimsy -- Nemo's Nautilus would pale next to the real, atomic version already in service in 1959. With the story firmly rooted in the fantastic, the biggest problems could be neatly sidestepped with fanciful silly-science. Verne's inner Earth isn't a furnace of molten rock and our explorers encounter fresh air, surface gravity and pressure all the way to the center. Best of all is the convenient invention of luminous rocks that allow both unassisted sight and Color by DeLuxe to function, long after the hikers' lamps have rusted out. What Journey to the Center of the Earth offers instead of scientific accuracy is adventure with a capital A, the kind that finds brave souls stepping off into the unknown with no reasonable expectation of coming back alive. It's the good-natured spirit that the great explorers and even Conquistadores must have shared: Life is short and cities are dirty and dull, so why not go for broke and risk all on a mad quest? The Scots and Icelandic explorers may argue about provisions and double-dealing, but all are behind the spirit of adventure, even the dastardly villain. James Mason's Lindenbrook is an expertly fashioned professor who sputters and throws the occasional tantrum. But he also beams like a 5 year-old at new discoveries and dances a jig upon hearing good news. Mason holds the picture together and his commanding voice smooths over the roughest episodes. When the center of the globe turns out to be a wholly illogical whirlpool in a wholly illogical ocean (which direction is UP? ), a couple of crackling lines of expertly-delivered dialogue, and a distracting cutaway to Diane Baker back up top, get us through. Mason treats his, "This is it! The magnetic center of the Earth!" line as beautifully as "Matters of this sort are best settled from a great height" from North By Northwest. Ex-MGM beauty Arlene Dahl was best known for some spectacular red-headed closeups in other people's musicals. The writers make an excellent case for bringing the requisite 'woman' along for what was originally an all-male safari into a hole in the ground. The Dahl character has a sense of dignity and helps place the story in a convincing period setting, while providing someone to scream at dinosaurs for the trailer. The engaging line of banter that ensues between the widow and her dead husband's rival is given its due instead of being used as filler. A real romance builds, along with our affection for all the adventurers, something rare in movies of this kind. There's a sense of class and balance to the light mood of Journey to the Center of the Earth that compares well with the later Spielberg Indiana Jones movies. They combine a similar spirit (and, in Raiders, a borrowed giant rock gag) with much more precise action, a ruthless pace and over-hyped violence that can be a real kick. But most new action adventures tend to run fast and stupid, with an impatience for anything but a shorthand beeline to 'the good stuff.' When a Spielberg-era thrill ride movie is over, we indeed feel as if we're being hustled out of the carnival tent to make way for the next batch of suckers. This old Fox film is slower but its characters are more satisfying. It has a feeling of substance, even with an ending that wraps things up with the convenience of a ride on an express elevator out of Alice's rabbit-hole. 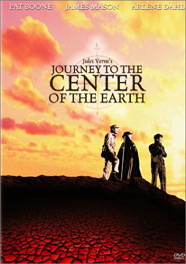 Fox's DVD of Journey to the Center of the Earth is bargain priced and devoid of new extras but the enthusiastic remastering job is gift enough. It's better looking by leaps and bounds than the 1990 'scope laser. 7 The Fox people have included a restoration demonstration with an intelligent set of text cards showing the difference between earlier masters, and even the difference between the newest film restoration, and the newest film restoration plus video improvements, a distinction often overlooked in reviews. Almost all of the show looks terrific, although the grain seems a bit exaggerated here and there, perhaps an unavoidable aspect of the original negative being deemed NG. Color values are excellent, but many images show signs of rescue fading - where density was lost. A few matte paintings stick out in the grayer areas, where join lines used to match but no longer do. The framing is a bit tight, but I'm unwilling to say that it's not the original, even if a couple of giant-lizard shots crop the animals in ways I don't remember. The important thing is that almost all the time, the show looks and feels great. The giant mountainscapes atop the volcano are awesome, and combined with Herrmann's exultant score, the most powerful thing in the picture. It's not unattractive, but the laid-back cover art isn't going to snag any buyers. I walked right by it in the video store, thinking it was a National Geographic or IMAX disc. The original poster art was so garish, however, that I'm glad they didn't use that. 1. From its trailer, the new release The Core looks like a silly rehash of this story, combined with Armageddon-style humor and plotting. The only other below ground thriller that still appeals to Savant is 1965's Crack in the World, a doomsday story that generates several moments of genuine excitement. 2. Not as shamelessly used for cartoony comedy as, for instance, Kirk Douglas' seal in 20,000 Leagues, the duck provides some needed relief along the trek. Gertrud is also a quite charming duck, thank you very much, and deserves a statue in the Edinburgh College yard for her supreme sacrifice. 3. Once again, nostalgia time. Journey to the Center of the Earth was my birthday trip into Honolulu from Hickam AFB on my seventh birthday, and it knocked me out. It had big lizards! It was perhaps the first film we went to to please me, and the first one where I discovered that somewhere out there people made movies just for me ... I missed all the sci-fi pictures of the fifties, and had to discover them at a remove on TV or in revivals later. So far as I was concerned, Journey was the best thing ever put on Earth .... I even remember the weird sound of the stereo track. 4. Another personal note: the 'Laird of wherever', the young student who gives Mason his prize at the beginning of the movie, was played by Peter Wright, who ended up being a top commercial editor. Savant was his assistant for a few years in the early 80s. Peter had been an aspiring actor in the late 50s and hung out with the likes of Gigi Perreau, Fay Spain and Scott Marlowe (lots of wild stories there), but his red hair and freckles didn't get him cast very often - until Fox needed a young Laird, fast. It's a nice bit role. Peter's background was impressive, too - his father was a top animation director for Disney, and his grandfather was Harold Bell Wright, the Arkansas (or is it Missouri?) author of books that became popular & influential movies, like The Winning of Barbara Worth and The Shepherd of the Hills. The IMDB has Peter mixed up with another, younger Wright, I think, unless his acting career has soared of late and I didn't find out about it. 5. Sharp-eyed correspondent 'B' has the answer, naturally: "Cooga Mooga Productions was Pat Boone's company. He told an interviewer a few years back that he still gets Journey checks from Fox." Thanks, 'B', and a grateful Cooga Mooga to you. 6. But hang onto the laser disc if you're a completeness freak -- it contains alternate scenes from the English version of the movie, where the college lads sing "Gaudeamus Igitur" instead of "Here's to the prof of Gee-ol-o-gee". I figure they swapped out the song because they thought the replacement might better express the students' love for the Mason character. Way down on the list of possible interpretations might be that "Gaudeamus" sounds too much like "God", if some brainless censor were to get worried about such things.